S Mobility Ltd (formerly known as Spice Mobility Ltd), an Indian mobility company, has entered the tablet market with the launch of Mi-720. 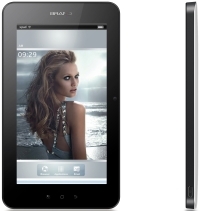 The tablet runs on the Android operating system and comes with a price tag of Rs 11,990. MiTab comes with a 17.75 cm (6.9 inch) capacitive touchscreen (800 x 480 pixel resolution) and runs on the Android 2.2 (Froyo) OS (unfortunately no Honeycomb). It is powered by a Qualcomm Snapdragon 800 MHz Turbo processor and supports up to 32 GB of expandable memory (with the help of a SD card). The device has a 2 mega pixel camera (with digital zoom and white balance) at its rear which can also record videos and a front facing VGA camera. Other features include Voice Call (by pairing a Bluetooth headset or with the inbuilt loud speaker), MS Office viewer (it supports MS office Word Excel, PowerPoint and PDF files) and Adobe flash player. The tablet supports full HTML browsing and has Wi-Fi embedded into it. Also, Wi-Fi tethering enables users to connect their phone to MiTab allowing it to act like router/modem for accessing the Internet. MiTab also features 3G high-speed packet access (HSPA) and can be used to configure multiple E-mail accounts. Additionally, applications downloaded from the Android market can be directly installed on the memory card, hence users can enjoy unlimited APP download. The tablet comes with GPS/AGPS which lets the user perform functions such as location tracking or turn-by-turn directions tracking. The device comes with Adreno 200 Graphics processor which according to the company will enhance the gaming experience of the user and it supports multiple video formats and also supports high definition video play. The dimensions of the device are 200mm x 116.5mm x 12.5mm and it weighs 485 grams. It has a 4200 mAh battery and comes in white colour. B K Modi, Chairman of S Mobility said, "There has been a growing demand for 'tabs' which can do so much ranging from multimedia to social networking to even your official work. MiTab is a result of that endeavor to provide the youth not only the super smooth touch experience but a stylish and feature packed product at an affordable price." MiTab's competitors in the Indian tablet market include the Reliance 3G tab (for Rs 12,999), Beetel Teletech's 'Beetel Magiq' (for Rs 9,999) and Mercury's mTab (for Rs 9,499).